"'...He was as tough and romantic as the city he loved. Behind his black-rimmed glasses was the coiled sexual power of a jungle cat.' Oh, I love this. 'New York was his town, and it always would be.'" -Woody Allen, from Manhattan (1979) While a Manhattan is a cocktail that serves a year-round purpose, perhaps because of its color, or that in its classic version (there are more "covers" of this drink than "Amazing Grace") it is whiskey-based, many consider the Manhattan an autumn cocktail. The calendar tells us we have another week and a half to go until the autumnal equinox arrives, but today, of all days, is perhaps one of the most appropriate on which to prepare and sip this drink. This is a day to be a proud New Yorker, or if not from New York City, at least celebrating the strength and determination of those who live and work here despite the odds. We'll never forget this day, but we're also not letting the evils in this world destroy our spirit. It's time for a drink! Here Caiafa uses Canadian Club 100% Rye (gold medal, 2016 NY International Spirits Competition) as the base, which though a controversial choice - most bartenders tend to reach for a more robust American rye such as Ritttenhouse bonded or a bourbon such as Maker's Mark - is perfect for a lighter, late summer variation of the drink. 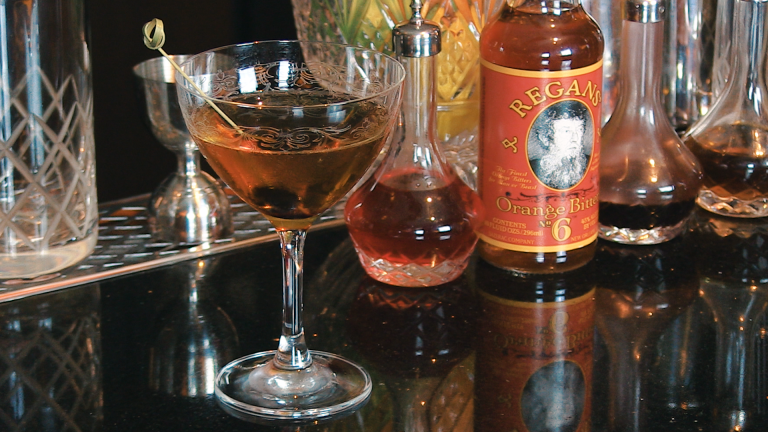 He mixes this with Dolin rouge vermouth and aromatic bitters. Want to use another base spirit? In this video, Caiafa explains how to experiment with those variations as well as deliver the proper stirring technique. Enjoy, and cheers to you, Manhattan!